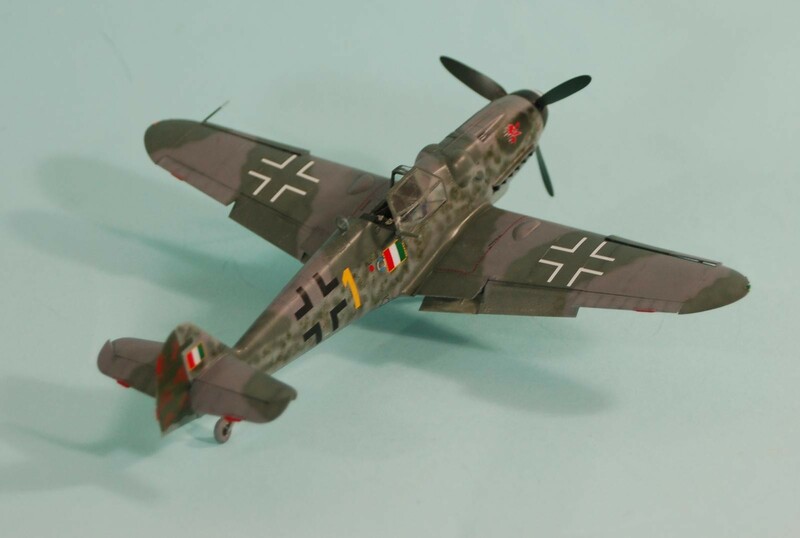 By the Spring of 1944, the Bf-109G-6, which had been the primary production version of Messerschmitt’s fighter since the previous fall, was falling behind in the relentless race for performance. Beginning in the late spring, many airframes were re-engined with the DB605D, on which an increased-diameter supercharger had been fitted and compression raised to from 7.3/7.5 to 8.3/8.5, using standard B4 (87 octane) fuel with methanol-water (MW50) injection, to provide 1,800 h.p. for take-off and 1,600 h.p. at 6,000 meters. That summer, production “standardized” on the Bf-109G-14, which could use this engine or the DB605CD, which utilized C3 (96 octane) fuel and MW50 to provide 2,000 h.p. for take-off and 1,800 h.p. at 6,000 meters. The Bf-109G-14 began production in the late spring of 1944 and arrived in the Jagdgruppen beginning in July. 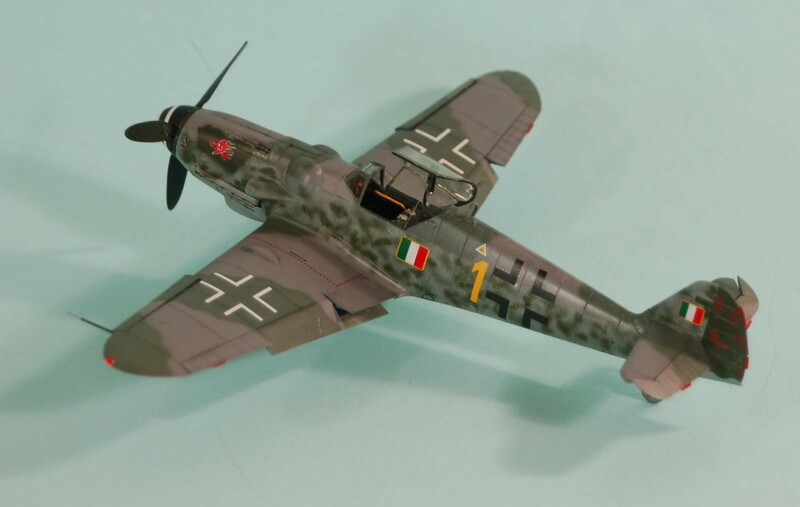 The “standard” G-14 was externally similar to the late production Bf-109G-6, with the main external identifier being standardization on the “Galland” hood for the canopy. The aircraft were produced with both the original all-metal vertical fin and rudder and the later taller wooden vertical fin and rudder. The “standard” G-14 was powered by the DB605AM utilizing MW 50 water injection for improved low/medium-altitude performance. A high-altitude fighter, designated G-14/AS, was also produced with the DB 605ASM high-altitude engine and was distinguished by the later streamlined bulged engine cowling similar to that used by the Bf-109G-10 and K-4 sub-types. The National Republican Air Force (Aeronautica Nazionale Repubblicana, or ANR) was the air force of the Italian Social Republic, which was formed following the rescue of Mussolini from his Allied Italian captors in the fall of 1943 following the invasion of Italy to administer northern Italy under the control of the German military occupation forces. 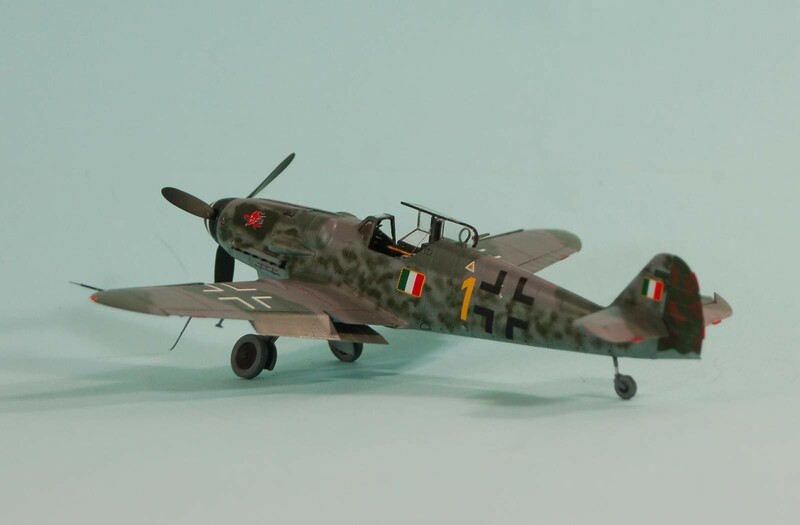 Combat operations began in December 1943, with the squadrons operating Macchi C.205 Veltro and Fiat G.55 Centauro fighters. In January 1944, the C.205s of the 1st Squadriglia “Asso di Bastoni”, engaged in combat with a formation of P-38 Lightnings, three of which were shot down. In April 1944, the German military authorities ordered the incorporation of the ANR into the Luftwaffe. In protest, the Italian pilots burned their C.205 and G.55 fighters. 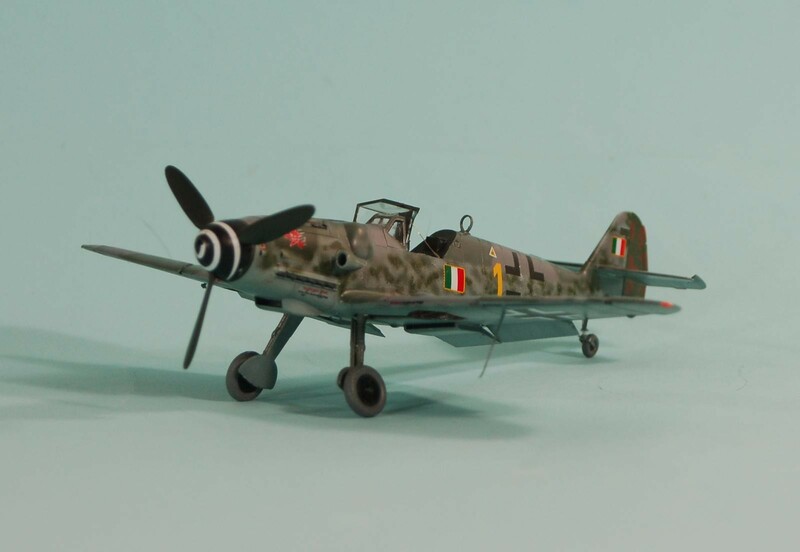 Beginning in June 1944, the ANR was re-equipped with Messerschmitt Bf 109G-6 and later G-10 and G-14 fighters. 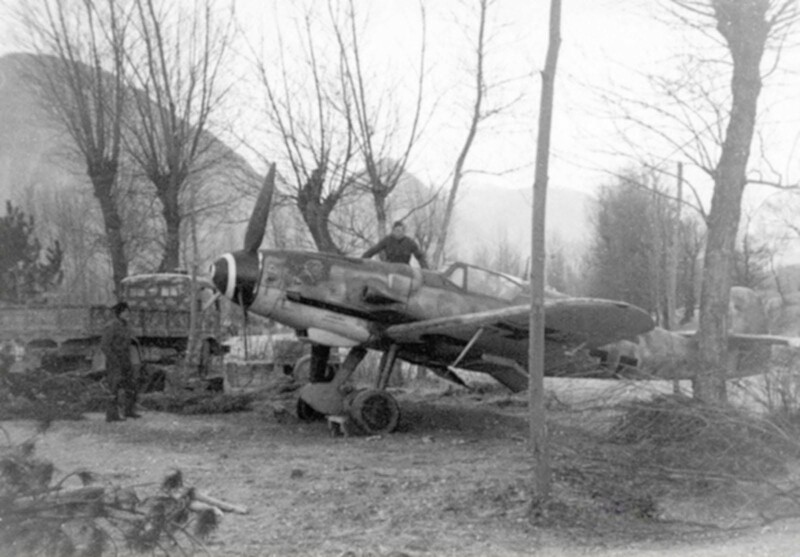 The last Luftwaffe fighter unit had departed Italy following the fall of Rome, leaving the ANR pilots with responsibility for air defense of northern Italy. 1° Gruppo Caccia “Asso di Bastoni” had suffered such heavy losses in the Cassino campaign that the unit was withdrawn for training in Germany from October 1944 to February 1945, when it returned to Italy. Between October 1944 and February 1945, 2° Gruppo Caccia “Gigi Tre Osei” was the only ANR fighter unit active in the defense of northern Italy. From November 1944, casualties began to outnumber victories for the Italian pilots. 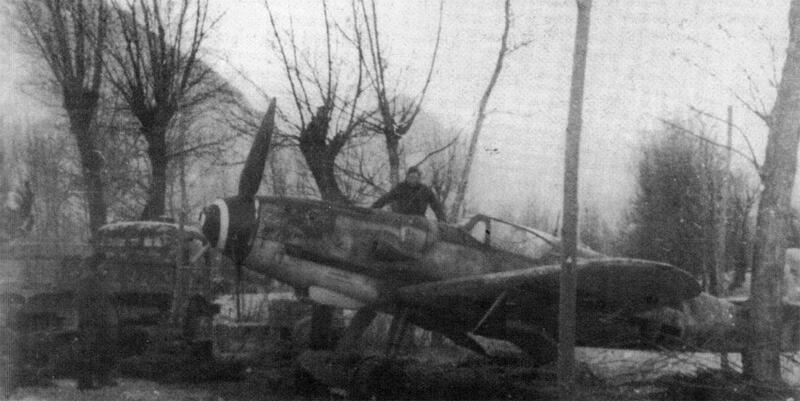 Throughout the Brenner Pass bombing campaign against the railroad that was the main supply route for the German armies on the Gothic Line, the ANR squadrons never had more than 40 fighters available at any given time and spent long periods without sufficient fuel available to make an effective defensive effort, due to the success of the Eighth Air Force’s campaign against the German synthetic oil industry after the surrender of Romania denied the Germans access to the Ploesti fields, which had largely been destroyed by the Fifteenth Air Force during the oil campaign in the spring and summer of 1944. The last interception mission was carried out on 19 April 1945 when 22 Bf-109s took off to intercept the B-25s of the 57th Bomb Wing in the Brenner Pass. They were intercepted by two squadrons of the Fifteenth Air Force’s 322nd Fighter Group, the “Tuskeegee Airmen,” and never got close enough to the B-25s for anyone in the bombers to be aware of their presence. 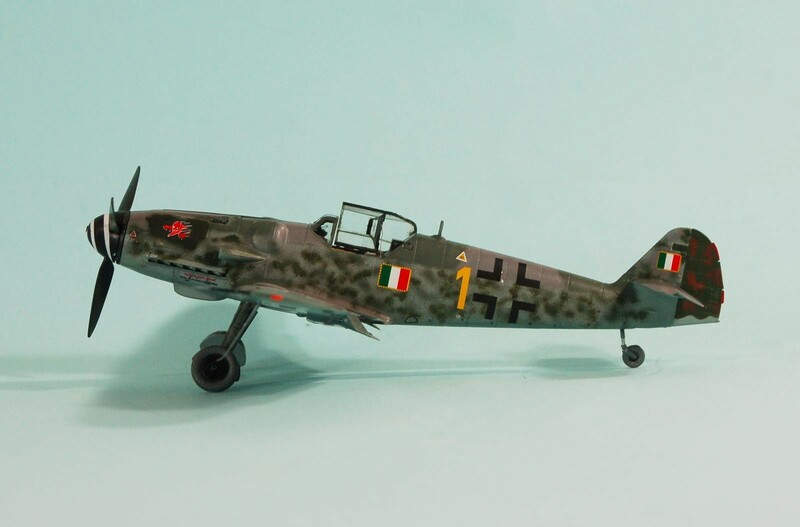 Six ANR pilots scored five or more victories against the Allies, including Maggiore Mario Bellagambi, commander of the 5th Squadriglia “Diavolo Rossi” of the 2nd Gruppo Caccia, who scored 10 of his total 14 World War II victories with the ANR and was the second-scoring pilot of the ANR. In 1949, veterans of the ANR were allowed to join the Aeronautica Militaire Italiana, the Italian Air Force. Bellagambi was among those who did so. By the time of his retirement in 1972, he was a Generale de Brigata Aerea. He died in 2001. 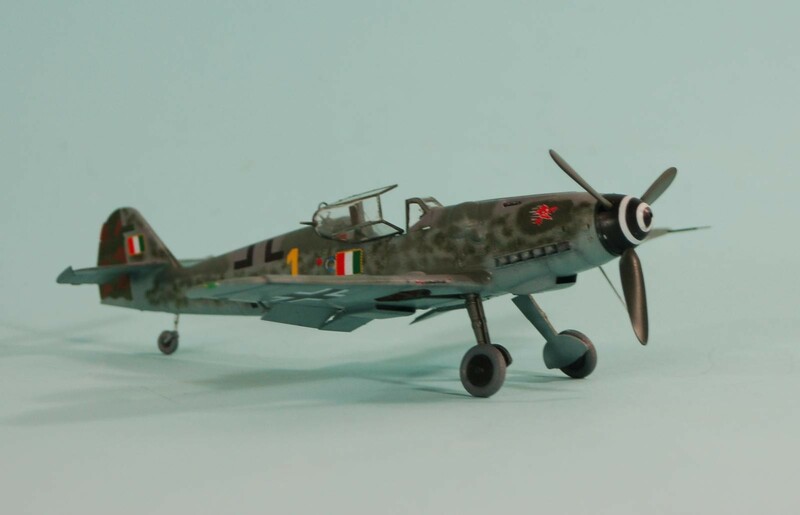 Eduard’s Bf-109G-14 was released in March 2018. 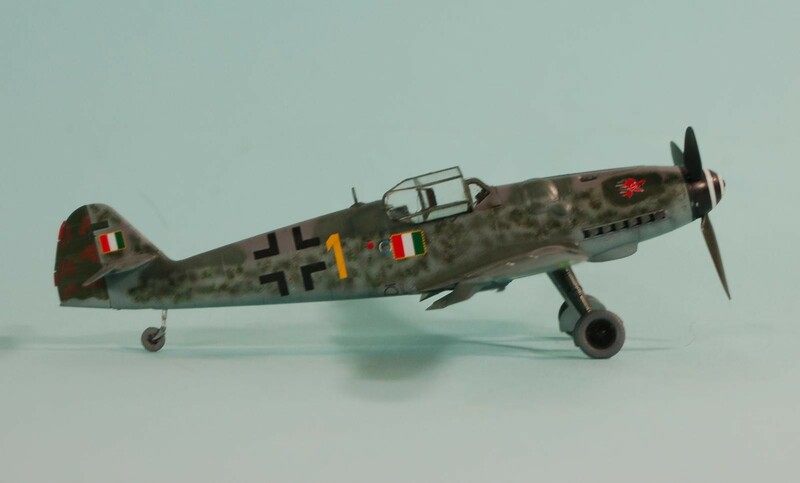 Essentially, it is the “late production” Bf-109G-6 kit with different decals. 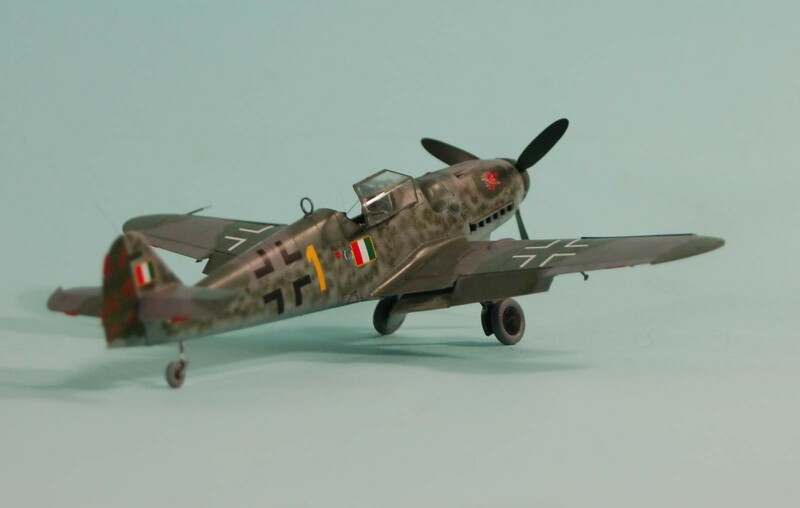 In this case, the options are: “Weiss Ein,” the Bf-109G-14 flown by Erich Hartmann as commander of 4./JG 52 in the fall of 1944, the second of his airplanes to carry the famous black “Tulip petal” markings; “Blau Drei,” a G-14 flown by Leutnant Horst Schlick of 4./JG 77 in the fall of 1944; the G-14 flown by Maggiore Bellagambi of 2nd Squadriglia “Diavolo Rossi” in the spring of 1945; “Schwarze Acht” flown by Oberleutnant Rolf Schlege, CO of 10.JG 4 in March 1945; and an unknown G-14 of EJG 2 found on Pilsen airfield in Czechoslovakia at the end of the war. The kit decals are of excellent quality. 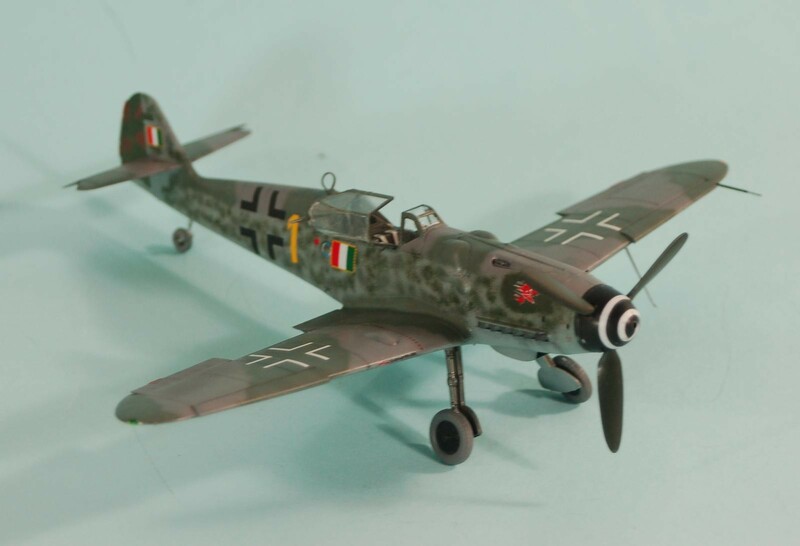 As a Profipack kit, the Bf-109G-4 includes photo-etch cockpit details – instrument panel and seat belts – which I used. I started by painting the cockpit, then assembling the wing sub-assembly while that dried, then constructing the cockpit and attaching it to the right fuselage half, after which I assembled the fuselage. The Eduard 109s are well-designed, and everything goes together with a minimum of fuss. If you take your time, you can assemble the kit without use of putty or filler anywhere. I used the kit decals, which went on without problem and settled quickly under an application of Solvaset. The only bits left after painting were the landing gear, prop, and canopy which was posed open. 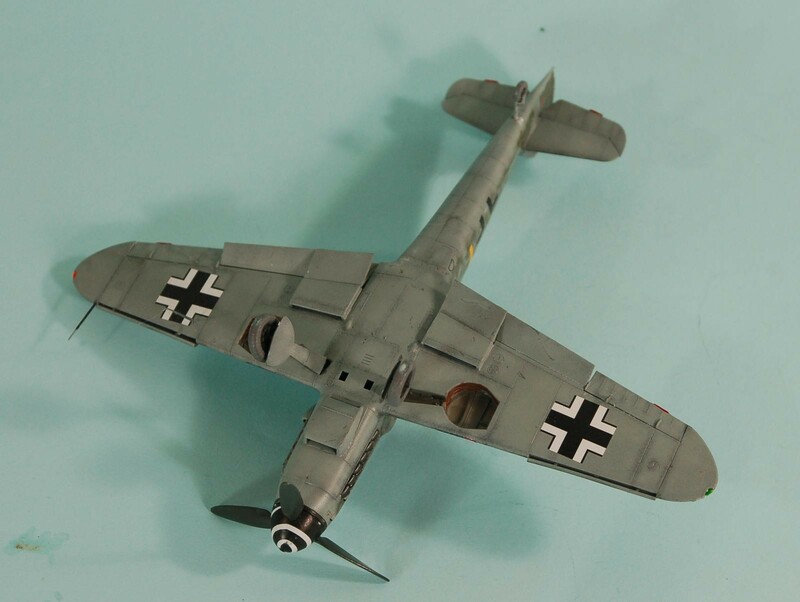 As is obvious, I like the Eduard 109s and personally think they’re the best in 1/48. I’ve had a chance to look at the Tamiya 109G-6 and personally wasn’t that impressed; I’m not a fan of Tamiya’s “toy” characteristics of their releases since the 1/32 P-51Ds, and they continue that with the new kit. The Eduard kits are continuing to come out in all the various sub-types, which is unlikely to happen with Tamiya’s 109. The kit is excellent value, and presents no problems for modelers willing to take their time in assembly and commit the revolutionary act of following the instructions, which is pretty much guaranteed to result in a very nice model. Very nice build Tom, I admire your attention to both historical accuracy and detail on this model. You did a splendid job on the “dotted” paint scheme so characteristic for this airplane. Congratulations! Tom – Your builds always look faultless and I’m always fascinated by your background research and knowledge. A great addition! You look at the banner photo and it’s got ‘Cleaver’ written all over it. Great build, Tom. And you are right, those Eduard Profipack 109’s are lovely. That said, I have a 1:48 Airfix Emil that’s just the thing for a wet weekend BoB project. That’s a great kit (other than the Bf-109G canopy). Nice job, Tom. Love the background info. Another beauty! You do seem to find interesting schemes to bring to life. An “interesting scheme” will always get my notice. I agree with Greg, this is an interesting scheme, well done! Whats the story with the red splotches on the rudder? The rudder was painted RLM82 green with RLM81 splotches brushed on. The color used was Tamiya NATO Brown, to simulate the color after it faded. Actually, 109 wheels do not sit 90 degrees to the ground, which is what makes them so difficult for landing and takeoff as the plane bounces from side to side. A real beauty Tom. The ANR story is interesting too & opens the door to a whole new range of marking options. Nice camo job. 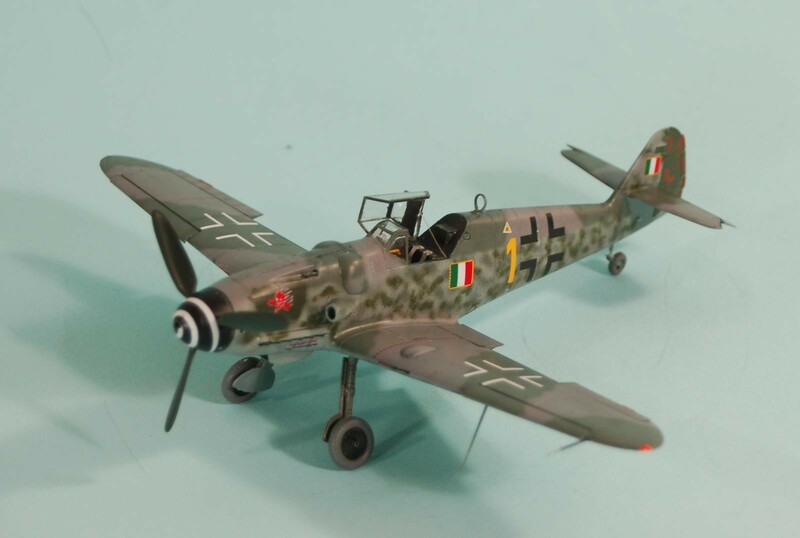 Really nice Bf-109! Yet another fine piece of work, TC…..I like it a lot. Great job as usual, Tom. Interesting subject too. I must say, I AM addicted to Eduard 109’s. I’ve got about six I have to get to.